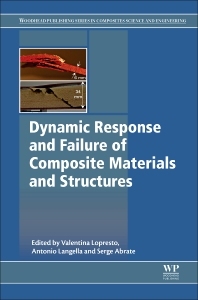 Dynamic Response and Failure of Composite Materials and Structures presents an overview of recent developments in a specialized area of research with original contributions from the authors who have been asked to outline needs for further investigations in their chosen topic area. The result is a presentation of the current state-of-the art in very specialized research areas that cannot be found elsewhere in the literature. For example, Massabò presents a newly developed theory for laminated composite plates that accounts for imperfect bonding between layers with new solutions for problems involving thermal effects. This theory is new and computationally-efficient, and the author describes how it fits in the broader context of composite plate theory. Abrate discusses the design of composite marine propellers and presents a detailed derivation of the equations of motion of a rotating blade, including centrifugal effects and the effects of pre-twisting and other geometric parameters. This book is a major reference resource for academic and industrial researchers and designers working in aerospace, automotives, and the marine engineering industry. Valentina Lopresto is Associate Professor at the University of Naples “Federico II”, Italy. She has been a member of the scientific committee, organizer and session chairman of several international conferences including (ECCM8, 15 and 16, ICCS16). She was also chairwoman and organizer of the DRaF 2014 Conference, September 2014, Ischia, Italy and acted as Guest Editor of the Special Issue DRaF 2014, in Procedia Engineering, Elsevier. She is currently Principal Investigator of the Erasmus Bilateral Agreement 2013-2017, with the Turkish Air Force Academy, Aerospace Engineering Department, at Istanbul and was Principal Investigator of PRIN 2009 National Project on “Experimental investigations and numerical models for the study of the low velocity impact damage and its evolution on composite laminates”. She has also been a Visiting Professor at University of California, Berkeley, May - June 2014. She has more than 100 publications is the co-author of two national and one international patent, reviewer for several international journals and national research projects by MIUR. Antonio Langella is Associate Professor at the University of Naples “Federico II”, Italy. He has been a scientific investigator for 32 research contracts and research projects. He was President of the Organizing Committee and Co-Chairman of the International Conference "First Symposium on Dynamic Response and Failure of Composite Materials, DRaF 2014, Ischia (Naples), 15-17 September 2014 and Guest Editor of the Special Issue DRaF 2014, Procedia Engineering, Elsevier. He was also President of the Organizing Committee of the Workshop "Numerical simulation with advanced composite materials", Naples, Italy, on 2013 in collaboration with MSC Software Italia srl., and a Member of the organizing committee of the Italian Mechanical Technologies AITEM Naples, 2011. He has been responsible for the organization of different sessions for the international conference on Composite Materials: "Advancing with Composites (1991-2008), and editor of the related book: ICME - CIRP (1998-2002). He has more than 115 publications. , and is co-author of one national patent and three patent applications as well as reviewer for several international journals and national research projects by MIUR and MISE. Serge Abrate is Professor at the Southern Illinois University, USA. He has been Guest editor of several special issues in various journals: Composite Science and Technology, Composites Structures, Composites Part A, the International Journal of Impact Engineering, Procedia Engineering 2014, and Meccanica and is a member of the editorial boards for the Int. J. of Mechanical Sciences, Composite Structures, Heliyon, Composite Materials, Curved and Layered Structures. He is author of one book published by Cambridge University Press (Impact on Composite Structures, August 2005, ISBN: 9780521018326), editor and co-author of two books published by Springer (Impact Engineering of Composite Structures, 2011, ISBN 978-3-7091-0523-8; Dynamic Failure of Composite and Sandwich Structures, vol. 192., 2013) and Author of several book chapters.